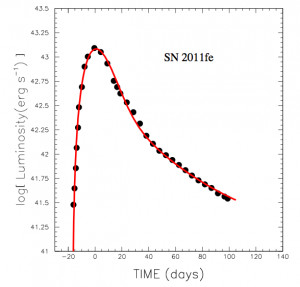 This shows the typical shape of an SNIa light curve. The black dots are observations, the red curve the authors’ formula. The vertical axis is the base-10 logarithm of luminosity (that is just the energy the supernova emits per unit time) and the horizontal axis is time. From the paper. 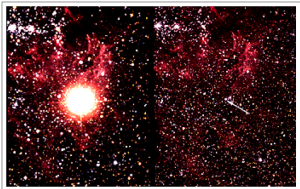 Type Ia supernovae are violent explosions that occur when the gravity in an old star (specifically, a type known as a “white dwarf“) overwhelms the pressure even densely packed, degenerate matter can provide and the star explodes. Why is it important that the star is old? The very oldest stars are no longer doing nuclear fusion, so they do not have heat providing a source of pressure to support them. Thus, as mass is added to them, for instance from a neighboring star’s shedding, they simply contract and become more dense. Eventually, they become so dense that particles are actually close enough to each other that quantum mechanical effects become important. Specifically, the “Pauli exclusion principle” says that two fermions cannot be in the same overall quantum state (fermions are just particles that have half-integer values of their intrinsic spin—imagine a sphere rotating with different speeds). Electrons are fermions, and the constraint that they cannot be in the same QM state means they must have some spatial separation between each other. This in turn means that, if they are compressed enough, they’ll push back, providing what is called “electron degeneracy pressure“. 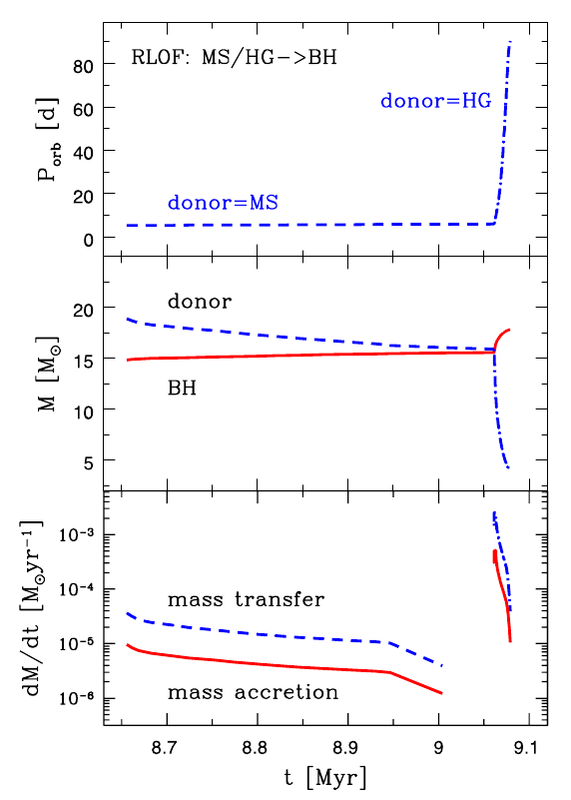 However, electron degeneracy pressure is not enough when the star reaches a mass of 1.4 times the mass of the Sun, and gravity wins (this mass upper bound is called the Chandrasekhar mass—he thought of it in 1931, way before any stars like this had been seen. But on the other hand, the Chinese observed a supernova in 1054 AD!) Everything falls inward, complicated physics ensues, and the star blows itself apart. Try saying those sibilants sixteen times swiftly. Then continue reading. What do we need to predict the luminosity (amount of energy emitted per unit time)? Well, we need a total amount of energy the supernovae produces, and an amount of time it takes to do that. To get the total energy, the authors assume that the SNe is powered at first by nuclear fusion of carbon and oxygen into higher mass elements. This gives a total energy. Assuming all of this energy goes into driving a huge, expanding fireball (of uniform density at any given moment), they calculate the expansion speed of the fireball, which turns out to be constant. This is important because it means that the size of the fireball is just a constant speed times time, so the size (radius, to be precise) increases linearly with time. Why do we care? Well, this is key for two reasons. First, the fireball loses energy as it expands, so the expansion rate tells us how much energy it loses per unit time from expansion. Second, the fireball also loses energy via photons inside it random-walking their way out (like a drunkard, they stagger in random directions inside the fireball, but they will eventually reach its edge). The time it takes them to do this is bigger if the distance they must cover is bigger—so the photon diffusion time will scale with 1/time since the explosion occurred. This may look scary, but let’s look at it step-by-step. It is just accounting. Just like the money you deposit in your savings account is just what you make minus what you spend, here, the total change in energy per unit time is just the energy produced minus per unit time minus the energy lost per unit time. E represents energy, t time. The term on the left-hand side is just the total change in energy per unit time. On the right-hand side, the first term is just the energy generation rate: all of the energy is assumed to be produced by the radioactive decay of the elements produced earlier by nuclear fusion. The second term, with brackets, on the right encodes 2 effects. The describes energy lost because the fireball is expanding—it grows linearly with time, so it loses energy like . The 1/ is the more complicated effect described above: photons random walk out of the fireball, taking energy with them as they do so. 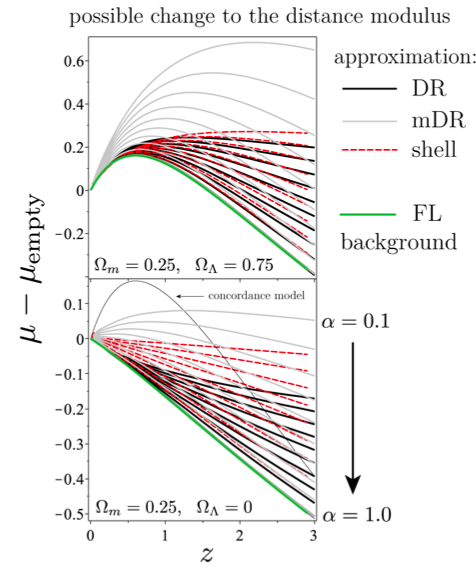 The authors solve this equation for how the energy behaves with time, and that gives them the light-curve, shown in the picture. From this, everything we actually observe about SNIa can be predicted, providing a great way for us to understand why the light-curve has the shape it does! Aren’t type Ia supernova thought to be the product of runaway thermonuclear reactions, and not collapse due to overcoming the Chandrasekhar limit? I am puzzled. People have been doing heavy simulations of SN Ia for years, I thought the results of those simulations were the main evidence for believing that SN Ia were fusion explosions of white dwarfs. Wouldn’t these simple patterns have been noticed long ago? I’m confused with this article, as one section discusses the energy coming from the complete fusion of carbon and oxygen into heavier elements, while another section indicates the energy comes from the decay of radioactive elements produced by fusion. 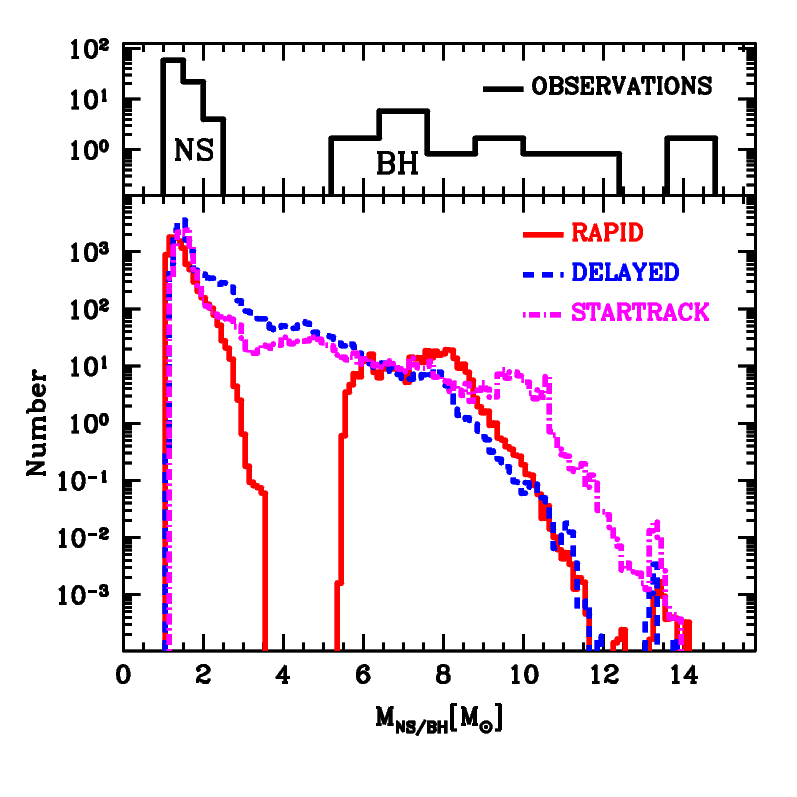 I saw this paper on the arXiv as well, but only now did I notice it on astrobites. This paper contains a subset of the content of Arnett 1982 (http://adsabs.harvard.edu/abs/1982ApJ…253..785A), except it doesn’t cite Arnett 1982 and leaves out a lot of the physical insight. There have been a number of weird, content-free papers on the arXiv lately especially within this particular sub-area. Anyone who’s interested in this topic should instead read Arnett 1982, which is a classic paper; just be prepared to follow a lot of variable substitutions.